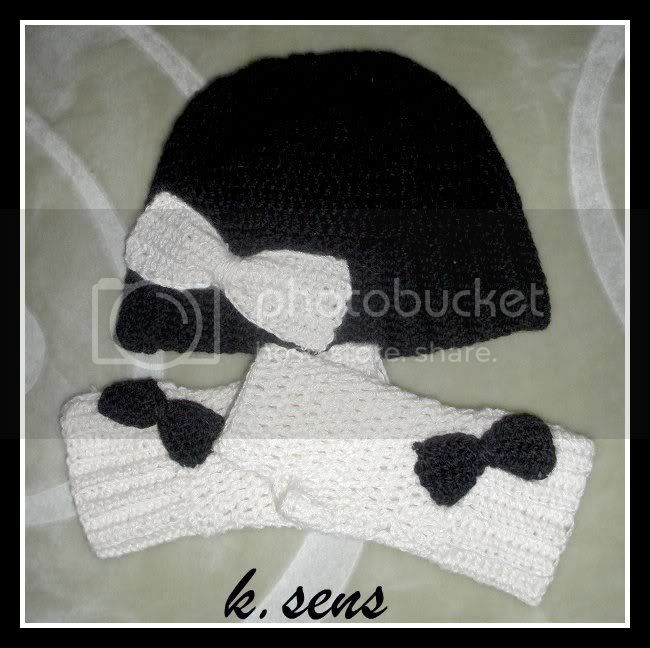 This is the most popular hat pattern on my original blog, and it would be just wrong not to allow a translation of it here as well, so I took few moments to add this free pattern. 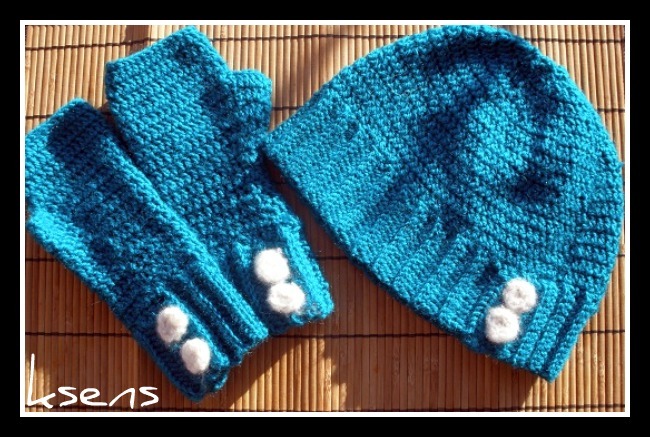 I also added the pattern for fingerless gloves to match the hat. Hope you'll enjoy it! - Replace first hdc on row with ch 2, finish row with 1 hdc in 2nd ch from beg of previous row. - Replace first dc on round with ch 3 and finish round with 1 sl st in 3rd ch from beg of round. Replace first sc on round with ch 1 and finish round with 1 sl st in ch from beg of round. Work 1 dc, but wait with the last pull-through (= 2 sts on hook), work next dc, but when doing the last pull-through pull thread through all sts on hook = 1 dec dc. Work 1 sc, but wait with the last pull-through, work next sc and pull thread through both sts on hook. - 1 hdc in 3rd ch from hook, 1 hdc in each of the next 11 ch = 13 hdc, turn piece. See CROCHET INFO-1. - continue with 1 hdc in each hdc but work each hdc in the back loop of st (i.e. not through the whole st) = rib-structure. When piece measures 52-56 cm / 20½"-22" make 2 buttonholes as follows: work 3 hdc, ch 2, skip 2 sts, 3 hdc, ch 2, skip 2 sts, 1 hdc in each of the last 3 sts, turn piece. Work 1 hdc in each hdc and 2 hdc in each ch space = 13 hdc, cut and fasten thread. Slip the edge tog to a ring with the 2 rows on the side with buttonholes sitting over the 2 rows the opposite side = buttonhole split. See CROCHET INFO-2. Beg by buttonhole split and crochet alternately 1 and 2 sc in each row all the way round NOTE: by buttonhole split crochet through both layers = approx 78-84 sc. Continue with 1 dc in each st, AT THE SAME TIME adjust no of sts to 80-88 dc by crochet 2 dc in 1 st with regular intervals. After 4 rounds with dc (piece now measures approx 11 cm / 4 3/8'') dec 8 dc evenly, i.e. work every 9th and 10th dc tog in Size XS/S and every 10th and 11th dc tog in Size M/L – see above. Repeat the dec on every other round a total of 5 times and then on every round a total of 1-2 times = 32-32 dc left. Now work 2 rounds with sc, AT THE SAME TIME work 2 sc tog all the way round on both rounds = 8-8 sc left. Cut the thread, pull it through remaining sts, tighten tog and fasten. Hat measures approx 23-24 cm / 9"-9½''. Sew buttons to the edge. - Ch 14 and work first row as follows: 1 hdc in 3rd ch from hook, 1 hdc in each of the next 11 ch = 13 hdc, turn piece. - Continue with 1 hdc in each hdc but work each hdc in the back loop of st (in.e. not through the whole st) = rib-structure. - When piece measures 20-22 cm / 8"-8 3/4" make 2 buttonholes as follows: work 3 hdc, ch 2, skip 2 sts, 3 hdc, ch 2, skip 2 sts, 1 hdc in each of the last 3 sts, turn piece. - Work 1 hdc in each hdc and 2 hdc in each ch space = 13 hdc, cut and fasten thread. Insert a marker in the middle of the edge of cuff. - Slip the cuff tog to a ring with the 2 rows on the side with buttonholes sitting over the 2 rows the opposite side = buttonhole split. - Begin by marker and crochet alternately 1 and 2 sc in each row all the way round (by buttonhole split crochet through both layers = approx 30-33 sc). - Continue with 1 dc in each st, AT THE SAME TIME adjust no of sts to 27-30 dc by crochet 2 dc tog with regular intervals – see above. AT THE SAME TIME after 3 rounds with dc inc 1 dc for thumb each side of first st on round - inc 1 dc by working 2 dc in the same st.
- Repeat the inc each side of this st on every round a total of 4-5 times = 35-40 dc on round (thumb sts = 9-11 dc). - Work next round as follows: 1 sl st in each of the 6-7 first dc on beg of round, 3 ch (= 1 dc), then 1 dc in each of the next 25-28 dc, 1 ch and finish with 1 sl st in 3rd ch from beg of round = 26-29 dc and 1 ch on round. - On next round work 1 dc in each dc and 1 dc in ch at the end of round = 27-30 dc. - Continue with dc in the round until mitten measures 17-20 cm / 6 3/4"-8" from cuff (3 cm / 1" remain, try mitten on for correct measurements). I added some crocheted buttons one some sets, and bows on others just to spice it up. 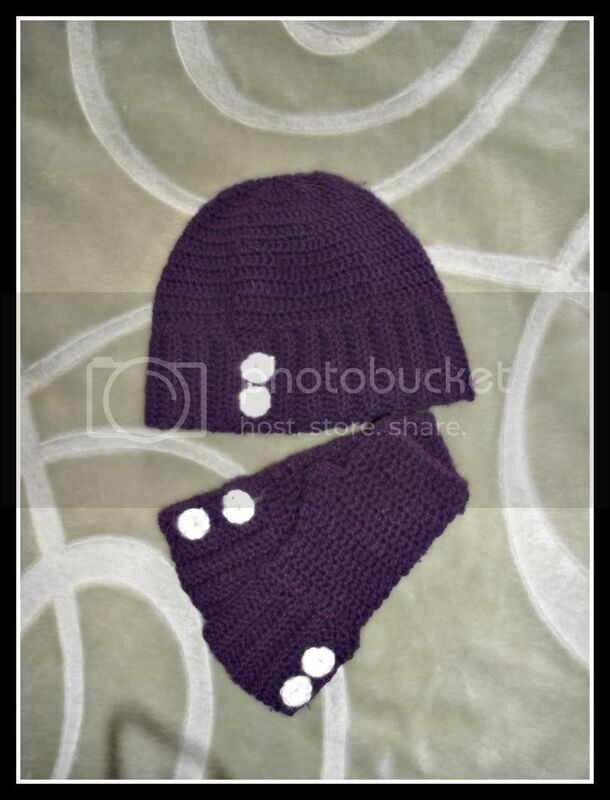 You can also use standard buttons and just sew them on. The pattern is NOT my design, it's a pattern from Garnstudio - DROPS Design. I just made the gloves fingerless and not mittens, but you can make the whole mitten from their pattern. The hat is made from their exact instructions. I made them a little shorter, but you can always check the pattern out on their site if you need additional help.